One more new place for shore fishing there is a public fishing pier on Mashes Sands and it ends in a good deep spot at the mouth of Ochlockonee Bay (Google Earth 29 20 41.34 -84 20 41.34) . It is just to the north of Mashes Sands County Park. 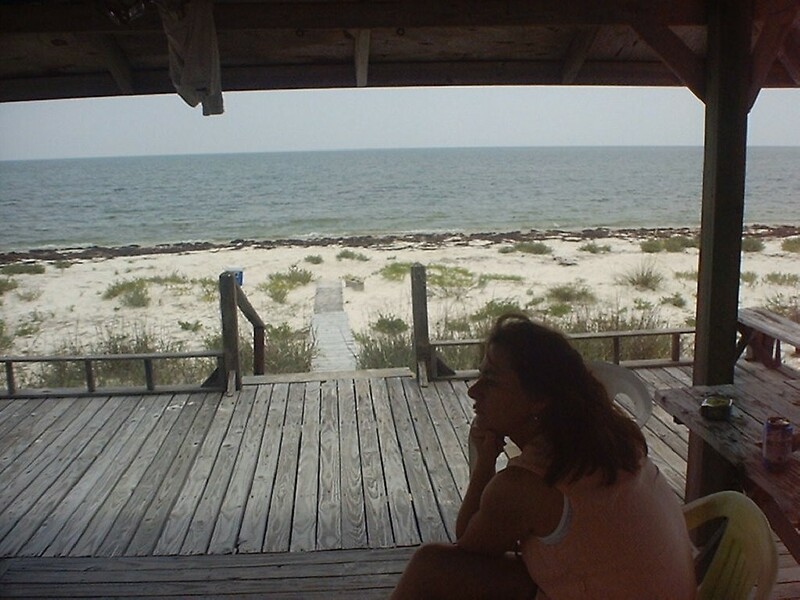 To get there from the house go to 98 west, and just before the Ochlockonee Bay bridge take a left on Mashes Sands road and go about 3 miles, the pier should be on your left just before the road dead ends into the park. If you don't see it drive down any road towards the bay, and you should stumble on it. If there is an attendant at the Park (this is not very predictable) they can tell you about it. We've never fished there, but the pier was built out into the Bay, near the mouth, at one of its deepest points; Fishing has often been good there from a boat or shore. You probably have to pay something to use the pier we're not sure. Rob has fished for the wily Tarpon, and hooked several, but he is yet to figure out how to actually catch one. This is supposed to be one of the best and least known Tarpon fishing spots in Florida. We have seen a lot hooked, and a few caught, one well over 150 pounds, but by better fishermen than us. Most of the fishermen you will see, and you wont see many, will be fishing from boats, but you can easily wade fish for the Tarpon. Click here to see a nice Tarpon jumping just in front of our house on Alligator Point. King Curry from Tuscaloosa a better fisherman than us took this photo. 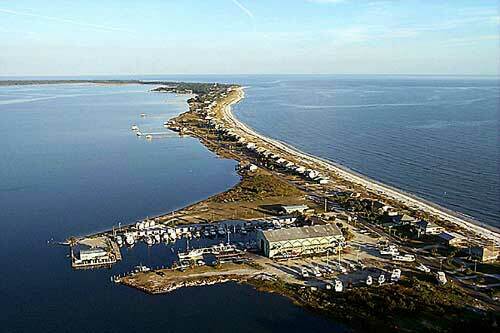 Good fishing (for fishermen of our caliber anyway) can be found off of Bald Point. Bald Point (Google Earth 29 56 51.68 -84 20 27.61) is down the Alligator Point road but keep right when you get to the Gulf.the opposite end of Alligator Point. Take the road to its end, this is Bald Point. Fish from the end of Bald point at the mouth of Ochlockonee Bay. At low tide you will see lots of oyster beds, cast towards them, you can wade a long way from here, and fishing around the oyster bays is good, but wear good shoes to protect your feet. The state of Florida has just purchased much of the land on Bald Point and is turning it into a small state park; it is nice place to go. The most prolific bigger fish here is the black tipped shark easier to catch big fish. These shark are generally in the 3 to 5 foot range and are not dangerous. You can catch them in warmer weather on most any bait, we have the best luck with a smaller live fish, about 5 inches, on a hook a few feet below a large cork or float. You can catch something for bait on a smaller hook or with a cast net or small seine. As far as we can tell these things are inedible, but every few years Rob gives one a try. The last one we attempted to eat was cooked by one of Rob's New Orleans cousins. Immediately upon catching the shark we gutted and skinned it and put it on ice. Then we took in home and soaked it for a few hours in milk. Rob's cousin then made gumbo from it. The most notable and probably only important ingredient was the copious quantities of beer that Rob and his relatives consumed as the shark was cooking. Soon everyone who was not participating in the beer drinking left the house and Rob and company actually ate some of the gumbo. It took several days to get the stench out of the house and neither Rob or his cousins are now allowed to bring shark home. The problem is that these shark have a foul taste and smell. Dr Pat Greany, of PDG Consulting in Tallahassee tells us: "It turns out that in addition to urea, sharks store a nitrogenous waste product called "trimethylamine oxide" in their tissues. As you already know, it's really smelly! Sharks use it as an aggregation pheromone. Apparently, high concentrations of this agent can prove toxic to humans." Knowing the taste and smell of our local sharks we doubt there is much risk of eating enough to be poisonous. To some degree all sharks have this same problem, but in the ones we catch here it is worse than most. Anyway they are fun to catch but we usually do catch and release. Other kinds of fishing include cast netting, seining and gill netting. This is a good place to throw a cast net, it's a good way to catch bait and if you know what you are doing it can also be a good way to catch shrimp or mullet. A 10 to 40 foot bait seine is fun and a good way to catch live bait. You will catch lots of interesting things. Gill netting is illegal, or we think it is check the Florida regulations before you try it, we know there is still a way you can use a shorter piece of net legally we just aren't sure how. Most gill netting was outlawed a few years ago and it has improved sport fishing, but it has made for a lot of unhappy local commercial fishermen. We hear that since the net ban has taken effect the gill netting is much improved, but now usually done at night. Florida requires a fishing license for any fishing (crabs included), and sells a separate one for salt water and fresh water, make sure you're legal. Florida also seems to have an ever-changing law on limits so get a copy of the latest regulations. You can buy your hunting or fishing license with a credit card by calling either 1-888-347-4356 or 1-888-486-8356 from anywhere in the United States or Canada, and within minutes you'll have a temporary license number enabling you to hunt or fish right away. Your permanent license will be mailed within 48 hours. You can buy Florida fishing liscenses online as well. There are lots of places to buy bait and tackle. More places to buy bait than gas or groceries. We buy a lot of bait from the BP station just off 98 east of the Ochlockonee Bridge. But they don't sell fishing licenses anymore, you have to go into Panacea, to Crum’s to get one, and we think the new bait and tackle shop on the west side of town has them too. 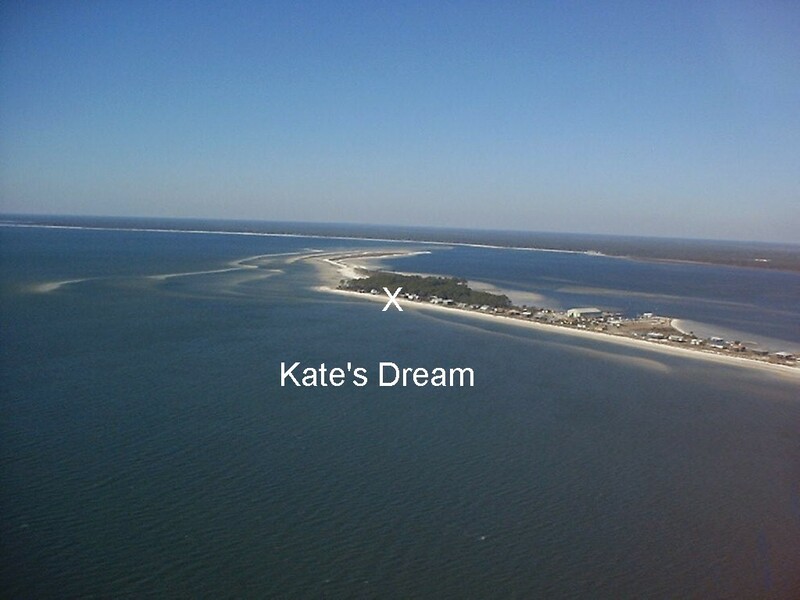 If you have a boat or are a serious fisherman this is an excellent place to fish the Gulf, one of the best in the state, for info on a fishing tournament out of nearby Carrabelle see http://www.saltwaterclassic.com. There is also very good freshwater fishing in nearby lakes and rivers. Catch crabs! (Blue crabs): This is usually the easiest and most productive fishing you can do, try year round, warmer months tend to be better. You will need a salt water fishing license. The simplest way is to set a trap(s) right off the beach, setting them in knee deep water at low tide usually works. You can bait it with fish or chicken parts (necks and backs work fine). We try to keep a few traps around the house, if you can't find one you can buy one for $20 or so. Please put our traps back so others can use them. You need a Florida Salt Water fishing license to do this! Got a boat? Bring it! There are several boat ramps close to the house. The best ramp is the Panacea town dock at the end of Rock Landing Road (Google Earth 30 01 19.02 -84 23 09.95) you can launch a big boat there and get out easily on most any tide. There is a good dock and good parking there and it is free. The ramp at the end of Bottoms Road is good (Google Earth 30 00 56.75 -84 22 05.27) but there is no dock and limited parking. There is a ramp near Mashes Sands (Google Earth 29 58 20.06 -84 20 45.45) it's a good ramp with a dock and good parking but check the chanel before launching it tends to silt up where it opens into the bay. There's another ramp at the end of Roho Road off of Surf Road (Google Earth 29 59 26.13 -84 25 52.81) but it isn't very good and the parking is very limited, not a bad place for a small boat or canoe launch but that's about it. There is also a poor launch just over the 98 bridge on Ochlockonee Bay (Google Earth 29 57 40.09 -84 23 05.81) but don't try launching much of a boat there. There are 3 boat ramps on Alligator Point, none of them much good. Most of these ramps are free, the one on Mashes Sands may have a charge and the Alligator Point ramp next to the marina may have a charge, all the others are free. Marinas: There are several marinas in the area, all small and varying from good to not so good. The closest one is the Port Panacea Marina (850.984.5844) at the end of Rock Landing Road, next to the public ramp, it’s a full service marina with a lot of good dry storage and a few wet slips. On Ochlocknee Bay off of Surf Road is the Bayside Marina (850.984.5548) it is small with limited facilities, call before you go there. There is a small marina next to Angelo’s restaurant, but we don’t know what if anything they have to offer to the public. On Alligator Point there is a good full service marina, the Alligator Point Yacht Basin (depending on what you call a Yacht you can count them on one hand, or less, mostly you'll see trailerable fishing boats there). The picture to the left is of the Alligator Point Yacht Basin. Ahh yes! We had a great time at your place. The beach was fab and the fishing was killer. Landed one 100 lb. tarpon and I purposefully broke off one that probably went 150 lb. after a 17 minute fight that towed us a mile and a half down Lanark Reef. My sons caught bluefish, a 12 lb. redfish, 22 and 12 lb cobia, seatrout, three different kinds of sharks, stingrays, skates, speckled back grouper and the ever present sailcats right off the beach in front of the house. We never had to walk down to the breakwaters, so don't underestimate the fishing in front of your Dream. We lost a number of strong fish, possibly sharks or Kingfish, that cut 60 and 80 lb. bite tippets. I left instructions for anglers in the Dream Diary. Thanks again for all of your help thru email, we did enjoy ourselves. Ernie is a professional fishing guide and writer from Tennessee (see http://www.tnwildside.org/stories.asp?Guide=Ernie%20Paquette) he and his wife also run the famous Zola restaurant in Nashville. Ernie was kind enough to leave some instructions in our guest book (July 2001). So, if you are a knowledgeable fisherman you may do a lot better than we have. Alligator Hunting A young blonde was on vacation in the depths of Franklin County. 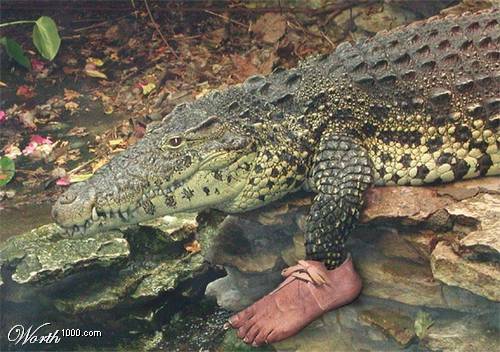 She wanted a pair of genuine alligator shoes, but was very reluctant to pay the high prices the local vendors were asking. Determined, the blonde turned and headed for the swamps, set on catching herself an alligator. Later in the day, the shopkeeper is driving home,when he spots the young woman standing waist deep in the water, shotgun in hand. Just then, he sees a huge 9-foot alligator swimming quickly toward her. She takes aim, kills the creature, and with a great deal of effort hauls it on to the swamp bank. Laying nearby were several more of the dead creatures. The shopkeeper watches in amazement. Just then the blonde flips the alligator on it's back, and frustrated, shouts out, "Damn, this one isn't wearing any shoes either!"